Having heard about stay along the waterhole and salt lick, I was so exited for my journey to The Ark. The official opening of The Ark on 25 Nov 1970 by Minister for tourism & wildlife the Hon J. L. M. Shako, M.P. Interestingly I started sighting animals on the way to The Ark. I spotted herds of buffaloes, elephants, warthogs, baboons. 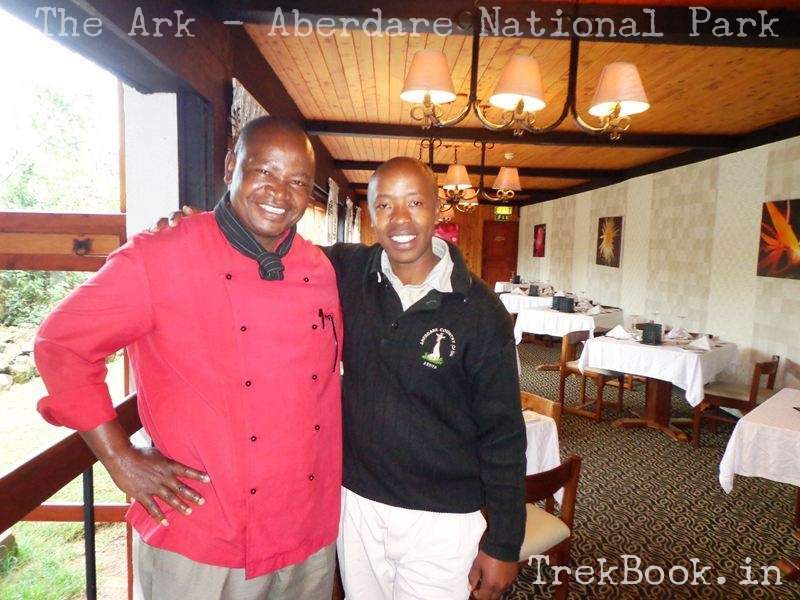 Our tour guide Nahashon told me that hyenas and leopard is also spotted many times in this region. Children below 7 years are not admitted at the Ark Lodge and/or Treetops Lodge. Before dinner, our guide Nahashon gave an informative talk about the establishment of hotel, nature conservation efforts by Kenya government, available animals and migration. I must say that Mr. Nahashon is one of the best guide I have met so far, he was knowledgeable & very much clear in communication. Special guest appearance after dinner by Spotted Genet … The hotel staff gives them chicken pieces ..
From the wooden bridge where bird feeding is done at 5 pm daily .. you will be able to see many birds .. The day we visited it was too cold for birds .. hence we could spot only a few of them .. Here are Mouse birds who stays together as couples ..
And finally the African squirrel eating the bread !! One more person I must mention here is Richard Hopkin an english young explorer on operation Drakl who got accidentally killed while working in the Aberdare national park on 25 Sept 1980 …. I salute to persons in this world who has devoted their life for nature conservation … Speechless now to talk anything more ….